Welcome to my virtual hangar. I am pleased to share some of my experiences with you and hope that you enjoy what you find here. Barry Schiff will personally autograph books purchased from this site. This is a unique opportunity to own some of the best known, most useful and highly respected books on flying, personally autographed by the author. You can even specify to whom you want Barry to autograph these books. Take advantage of this unique opportunity now! 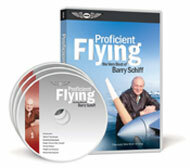 Barry uses his accomplished teaching skills to help pilots visualize techniques and procedures that can make them safer pilots. He brings critical subjects to life and creatively uses his educational skills in a way that makes these lessons invaluable and memorable. Barry's video segments were chosen for worldwide viewing on Speedvision. Buy the full set now! On May 23, 1995 Barry Schiff led an historic flight from Jerusalem, Israel to Amman, Jordan -- Codename: Operation Peace Flight. This video is an emotional and stirring account of the first flight, civil or military, ever allowed between these two countries. Read the fascinating story about Barry's historic flight from Israel to Jordan. You can now watch the 47-minute video detailing this historic flight on YouTube. Between 1959 and 1962 Barry wrote and produced 10 educational record albums (12-inch, 33-1/3 rpm records) that were successfully used for training pilots all over the world. They were recorded in-flight, edited on the ground, and then narrated professionally at Capitol Records in Hollywood by Vincent Pelletier. Although the material is more than 50 years old, these training albums provide an interesting perspective of the way it used to be. Interestingly, much of it is still applicable. The four most popular albums are now available on archival-quality CDs.